I would say popular bloggers are those who have reached commenting Nirvana. Though some of them might not agree with me, especially if they attract inappropriate attention. But for the ordinary, mortal blogger, getting a reasonable amount of interest that results in a regular flow of interaction would be commenting Nirvana. You would have reached your blog's ideal or idyllic state: a community of like-minded readers who consistently return to read your posts. And in addition they feel compelled, or comfortable enough, to reach for the commenting box to have their say. So what do you need to do to reach this elevated status? First of all, how easy is it to comment on your blog? This may sound like a silly question, but for some blogs it's not. I have come across many magazine-style blogs that disallow comments, and they wonder why they get so little interaction. How quickly can your readers find your comment box? Could it be hiding underneath a myriad of recommended posts? Maybe your digital marketing adverts are taking over? Perhaps it is buried under lots of other comments? And do you have stringent moderation measures in place to prevent spam? Or do you wait forever before you publish and answer your comments? All these barriers may hinder encouraging your readers to comment. Think how you can overcome this. The subject matter of your blog post is vital towards attracting comments. It needs to resonate with your readers. The topic should not only attract their attention, but be part of how they go about their daily lives. The three main categories of blogging are food, travel and fashion. These subjects cannot fail to attract readers. These bloggers can explore the transient heights of their expertise, experiences and excitement, relaying their thoughts and aspirations to inspire others. But your blog's material may be different. Work at building a readership with similar view-points to share and stories to tell. Make it easier for them by pre-empting this in your posts. What particular topics can you write about that would make them want to return for more? It is important to fully understand your readers. Otherwise how will you be able to write the kind of posts they want to read? You need to get inside their heads to know what they are thinking. Work out how they perceive the world by imagining yourself in their shoes. Another part of this is understanding the kind of words your readers would use. Getting your vocabulary right is vital to avoid alienating your audience. Research into what other blogs they read. And knowing their level of comprehension is always a good idea. Totally immerse yourself within the mental state of your readership. You will soon reach commenting Nirvana if you provide perfectly readable prose your readers crave. You're not going to get a commenting readership if you aren't able to capture them in the first place. This means you need to write a headline that both attracts attention and says exactly what on the tin. It's not worth being ethereal and cryptic in the titles of your posts. Your readership is bound not to understand or appreciate how clever you are. The best policy is to state the obvious and pin-point exactly what would stimulate an immediate positive response. What problems do your readers have at the moment? Is there a solution you can offer them? Show your empathy by saying you're on their side. Revel in their joy and celebrate their achievements. Ask a question they can answer in their heads. Having aroused your reader's attention, you need to deliver the goods. The best place to start doing this is in the first paragraph. The first 100 words can make or break a post, as the reader will make their decision whether to continue reading or not. This is where you need to summarise the post's contents, without giving it all away. Tell your readers about a promise you've hidden somewhere within the text. Give them little hints about how they will benefit from it if they find it. And make sure that when they find this nugget of information, or the life-changing experience, it is worth their while. Readers don't appreciate being short-changed. It's always better to over-deliver than to promise something you cannot honour. 6. No need to deliver everything! A post that is stuffed to the gills with information, and leaves nothing out, may satisfy the writer, but not necessarily the reader. Sure they are satisfactorily educated, but you haven't provided them with any opportunity to add to your post. Inspiration for commenting comes from having something further to say. A point that enhances or a correction to an error. An obvious gap that needs filling is always inviting to a reader who knows the answer. Leave something out on purpose. Ask for your readers' ideas. Even go as far as promising the remainder of the post to those that leave a comment. You need to provide the space for your readers to fill, or they won't feel wanted or appreciated enough to participate. At the end of the day, you can't expect your readers to automatically comment. For the majority of them, this wouldn't be in the fore front of their minds. So you have to ask them to give you some feedback. This is usually in the simple format of a call to action at the end of the post. It could be a question, a suggestion, a controversial statement, a recommendation, a request to click on a button (that goes to a specific page in your blog or website). If you have pitched this right, your readers will react. And the more that do will get you closer to achieving commenting Nirvana, and a popular blog into the bargain. 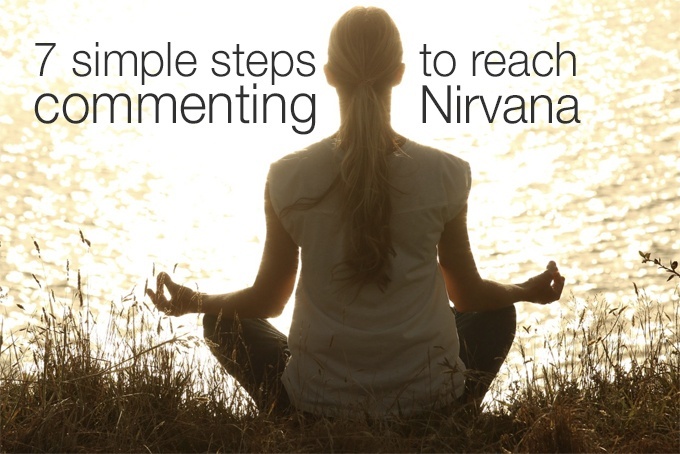 Have you reached commenting Nirvana yet? Tell us in the comments below about your transcending successes and ethereal journeys towards commenting Nirvana. Did you manage to get to that desired higher plane? I’m wondering if such a place exists Alice? I can see that many bloggers will find a happy place where they’re writing content their readers want to read, and their traffic and engagement grows. I think it’s maybe that I think of blogging as not only challenging the reader, but the writer too. If this was the case, then they’d always be growing and changing things they do to reach their next goal. Thank you Tracey-Jane for your comment. I envisaged a successful blogger with lots of commenting readers who impatiently waited for each new post and pounced on it ready with their opinions. Back in the old days there were plenty of these kinds of bloggers. But now it seems this is far and few between. It’s worth finding a successful blogger to analyse what it is that makes them so. It may be due to popularity: regularly responding to comments, or writing the kind of posts their readers want to read. Or it even may be commenting and interacting elsewhere other than their blog. Being visible and having the ability to respond well to your readers is certainly the first step towards Nirvana.